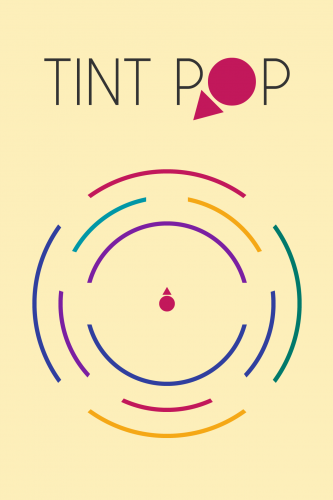 Tint Pop is a free to play game that actually delivers on what it promises…for the most part. The concept is simple (aren’t they all? ), tap the screen to shoot the ball in the direction the arrow is pointing. 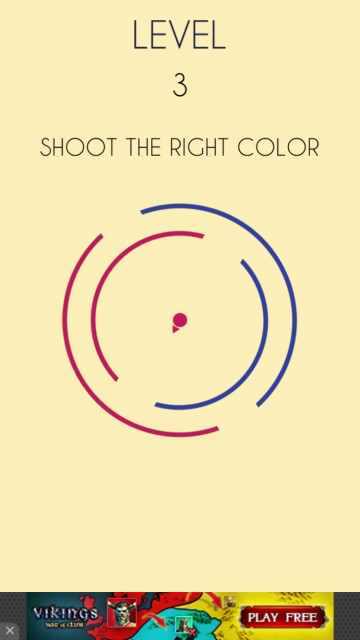 Coloured arc’s rotate around the ball & you have to shoot them to complete a level. The challenge comes from the rotation & the colours. You can’t just shoot any arc you want, you have to match the colour of the ball to the arc & shoot them in order. This can be quite challenging in further levels but it is surprisingly addictive. It’s definitely a ‘try just once more’ kind of game. Gameplay is backed up by relaxing sound design, something that many other reviewers have praised but I must be hearing something different. Don’t get me wrong, its tones are nice & mellow but it repeats every 10-15 seconds. Also if you listen carefully you can actually hear the track jump as it ends & than restarts. After 5 minutes of this I had to mute it as it was so annoying. That isn’t good sound design. As a free to play you have to expect in-app purchases & ads. The latter coming after a handful of levels finished or failed. 15 colour circles for 79p, 35 colour circles for £1.49 and 100 colour circles for £2.29. These are used to skip levels, with each skip costing 10 in total. Can you see the problem? These in app purchases are offering to skip the only playable part of the game. There is no story here; you will literally be paying to not play the game. Pay to win? Win what?